'Pink slime' strikes at heart of food fears, Y! Big Story: Pink slime and other food fights, The meat industry has produced "lean finely textured beef" for years, so what triggered the uproar now? As if dirty chicken coops, salmonella-tainted peanut butter, and melamine in pet food weren't enough, along comes "pink slime." Pink slime—as some call it but known in the meat industry as lean finely textured beef—isn't illegal or even new. What the ruckus about it reveals is the distrust consumers have about food safety, even as they become more educated. Disagreements over the degree of government intervention aside, more state and federal laws are coming into effect now to protect and improve our food supplies (among them the Food Safety Modernization Act and The Healthy Hunger-Free Kids Act of 2010). The latest rounds in the food fights—in the beef industry and beyond—have revived arguments over disclosure, and the trade-off between food safety and the use of chemical additives in food production. And these days, the fights are getting more heated. The Upton Sinclair effect. America has kept a keen eye on the meat industry ever since "The Jungle" published in 1906. The muckraker-author set out to expose working-class immigrants' grinding poverty and upper class corruption. Instead, details about spoiled meat, unsanitary conditions, and bodies falling into the lard machine grossed people out so much, the Pure Food and Drug Act and the Meat Inspection Act passed within a year. More than 100 years later, people are still trying to figure out what's in meat, as well as in poultry, fruit, dairy, and just about anything we put in our mouths. Works like "Fast-Food Nation," "My Year of Meats," "Food, Inc.," "Super Size Me," "The Ominivore's Dilemma," and "In Defense of Food" have focused on where food comes from, how we process and deliver, and the amounts we consume. Throw in high-profile recalls, small-farm focus, multinational globalization, rise of organics, locavore movement, obesity campaign, and sugar toxicity: All this has given people much to chew on. How a private email led to this latest food fight. Lean finely textured beef (LFTB) doesn't sound so bad, but a microbiologist's way with words—coupled with a celebrity chef's outrage—caused nationwide revulsion, hamburger chains to take out full-page ads disclaiming all slime-age, and meat-processing companies' bankruptcies and plant closures. Microbiologist Gerald Zirnstein had intended his phrase in an email, "nasty pink slime," only for fellow scientists at the U.S. Department of Agriculture. A disgusted Zirnstein, who inspected the Beef Products, Inc. (BPI), had been upset that its trimmings had been approved for the consumer market. The meat industry, for its part, has created a page explaining the practice, made possible decades ago thanks to a new technology. (A 2008 BPI webpage describes meat going through de-sinewing, centrifugal force, and a "PH enhancement process.") The fight got political: The Iowa governor decried the pink slime "smear campaign" and promised a Congressional investigation. "If they get by with this," he declared, "what food product is next?" The beef with (lean finely textured) beef. Companies have lined up to announce that they either never had carried or would stop carrying LFTB. (See chart below.) The USDA decreed that schools, the largest focus of chef Oliver's outrage captured in his now-canceled show "Food Revolution," could opt out of buying it for kids' lunches. A former undersecretary of agriculture and industry consultant has defended the practice—and underscored the great divide between farm and table. What does ammonia hydroxide do? The USDA Food Safety and Inspection Service, which inspects meat, poultry and eggs, outlines approved chemical treatments, like the injection of ammonia hydroxide. That practice has been around for decades. Fatty trimmings, Reuters explains, "are more susceptible to contamination than other cuts of beef" and need the ammonia to kill pathogens like salmonella and E.coli. Bear in mind, the zapped trimmings (usually about 15 percent of the ground beef) doesn't make the overall beef safer. The chemical is accepted in many goods, "according to the General Standards for Food Additives set forth by the Codex Alimentarius Commission, a group funded by the World Health Organization and the United Nations' Food and Agricultural Organization." Naming names in labels. Not everyone is so sanguine over a "puff." Some call for a ban, others just want disclosure. 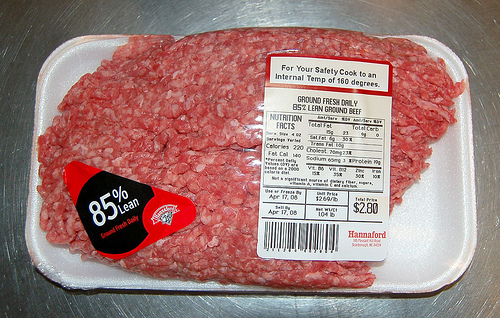 A Maine congresswoman proposed the Requiring Easy and Accurate Labeling of Beef Act (REAL Beef Act). Just Label It is another movement demanding food transparency. A "record-breaking one-million public comments" signed a petition requiring genetically engineered food be labeled. The Center for Food Safety, which submitted the petition in March, noted that nearly 50 countries require labeling, and in the past year 36 bills "dealing with the labeling of genetically engineered foods have been introduced" in 19 states.